Teresa Collins coordinating "Save the Date" Wood Veneer - includes 425 wood venner shapes. Teresa Collins Designs "Save the Date". This is a beautiful set that you will love! Teresa Collins coordinating " Save the Date " Decorative Brads - includes 25. 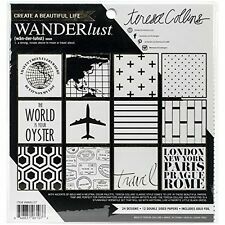 Teresa Collins-Wanderlust Paper Pad. The perfect start to your next paper crafting project! Acid and lignin free. The perfect start to your next paper crafting project. The perfect additions for all your paper crafting projects. These papers have accents of gold and a neutral color palette. There are 12 double sided papers with 24 designs! Great value! This is for Teresa Collins HE SAID SHE SAID 12X12 Double sided paper and one 12x12 Sticker Sheet. Then you should be able to request and a combined invoice. Prima Sunrise Sunset -12x12 double-sided paper: 7 pages. 1 pkg file folders (4). 1 pkg borders (16 paper and 4 glittered). 1 pkg decorative buttons (19). 1 pkg photo corners (24). Teresa Collins Designs "Save the Date". This is apretty line from Teresa Collins. Teresa Collins coordinating " Save the Date " 6x12 Decorative Sticker Sheets includes 2. Most international orders will arrive within one or two weeks depending on locations. Teresa Collins Designs "Candy Cane Lane"Set A. Teresa Collins coordinating " Candy Cane Lane" Brads - includes 25. Teresa Collins coordinating " Candy Cane Lane" Buttons - includes 25. This is afun line from Teresa Collins. 24 SHEETS 6" x 6" ~ 12 DOUBLE SIDED DESIGNS ~ SCARPBOOK PAPERS. DRAG MOUSE OVER PICTURE FOR MORE DETAILS. A MUST HAVE SET AND MAKES A PERFECT GIFT OR ADDITION TO ANY COLLECTION. There are 23 full sheets. There are 2 each of 12 double sided designs with one of the blue floral pattern sheets 1/4 used.There is a picture showing the paper that has been cut. This paper pad has been retired. Teresa Collins Scrapbook Collection Pack Kit Something Wonderful SW1024 – NIP!! Teresa Collins Designs "Candy Cane Lane"Set c. Teresa Collins coordinating " Candy Cane Lane" Buttons - includes 25. This is afun line from Teresa Collins. Most international orders will arrive within one or two weeks depending on locations. There are 23 full sheets. There are 2 each of 12 double sided designs with one of the blue pattern sheets 1/4 used.There is a picture showing the paper that has been cut. This paper pad has been retired. (Photos of a finished album above were taken of Christine Slak's finished product sample.). Retired 2008 Favorite Recipes album kit. Teresa Collins Silver Book Plates, 7 Pieces, New. Shipped with USPS Priority Mail. FROM JUNKITZ. TERESA COLLINS SHABBY CHIC COLLECTION. Teresa Collins. The Teresa Collins Sports Edition 7" x 13" Album Kit includes SCRAPBOOKING KIT. Sports Edition 7" x 13" Album Kit. Sports Edition Die-Cut Card Set and Five Assorted Sports Edition Die-Cut Charms. Brand new kit! Includes: 12 sheets of printed paper, 1 sheet of decorative stickers, 1 sheet of chalkboard stickers, and 1 sheet of letter stickers. Paper is 12” x 12” size. From American Crafts brand. Please ask any questions you may have. I will combine shipping on multiple purchases if paid together. Payment due upon receiving invoice. PayPal only, will ship only to US. New Sports Edition Scrapbok Kit TC-8985. 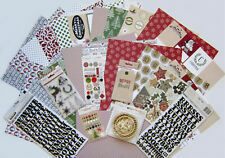 Teresa Collins-Winter Paperie Stickers: Label. 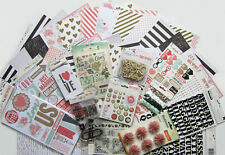 The perfect addition to your paper crafting projects and more! Made in USA. UPC: 846831063216. Winter Paperie Stickers Label. Master Card. The perfect start to all your paper crafting projects! Made in USA. UPC: 846831063186. Master Card. This is abeautiful line from Teresa Collins. Teresa Collins coordinating " Noel" 12 x 12 Die Cut Sheet. My Mind's Eye coordinating " Cozy Christmas" brads - includes 27. Most international orders will arrive within one or two weeks depending on locations. Trending at $22.08eBay determines this price through a machine learned model of the product's sale prices within the last 90 days. This is abeautiful line from Teresa Collins. Teresa Collins coordinating " Noel" 12 x 12 Die Cut Sheet. Most international orders will arrive within one or two weeks depending on locations. Teresa Collins Designs "Candy Cane Lane"Set d. Teresa Collins coordinating " Candy Cane Lane" Buttons - includes 25. Teresa Collins coordinating " Candy Cane Lane" Photo Overlays - includes 10. This is afun line from Teresa Collins.